Search for the latest homes, condos, and lots for sale along Scenic 30A in Florida. 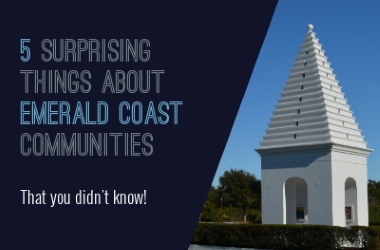 Learn more about 30A communities with our local 30A Guide. Explore other coastal communities and listings. Along the coastline of the Gulf of Mexico on Florida's Panhandle, is a stretch of two-lane highway called Scenic Highway 30A. Now more than just a road; it refers now to the trendy string of beach communities that run alongside it. Driving East to West on Florida's Emerald Coast, you will find Dune Allen, Blue Mountain Beach, Grayton Beach, Watercolor, Seaside, Seagrove Beach, Watersound, Alys Beach, Seacrest, Rosemary Beach, and Inlet Beach. Each has their vibe and unique spin on beach living. Famous for its natural beauty, rare coastal dune lakes, world-class sandy white beaches, and turquoise waters, 30A has a little something for everyone. If you are looking for a home, the 30A real estate market has a house for you. From a West Indies inspired house in Rosemary Beach or a Florida coastal cottage with a white picket fence in Seaside, the perfect 30A house is there. For those looking to get outdoors, stop at one of three state parks in the area or venture over to Destin for some family fun and shopping. The Emerald Coast's 30A is a little slice of paradise. The listings on this page include real estate properties along Scenic 30A on the Emerald Coast of Florida. If you’re interested in scheduling a showing or learning more about any one of these homes, simply fill in your contact information and click the “Request More Info” button. Our team is here to provide you with any information you need, including disclosures, the sales history of a property and nearby market data.